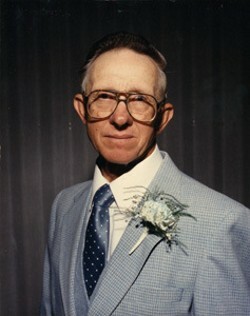 Robert Andreesen, age 84, died Saturday November 7, 2009, at the Monticello Nursing and Rehab Center. Services will be held 10:00 am Thursday November 12, 2009 at the Wayne Zion Lutheran Church in rural Monticello. Rev. Jonathon Kosec will officiate at the service. Friends may call from 4 to 7 Wednesday November 11, 2009 at the Goettsch Funeral Home in Anamosa. Internment will be at the Antioch Cemetery in rural Anamosa. Surviving are his daughter Sheryl (Mark) Dlask of Olin and a brother John (Jan) Andreesen; he was preceded in death by his parents; and a sister Betty Andreesen. Robert Henry Andreesen was born November 5, 1925 in Anamosa, Iowa. He was the son of John and Bessie Horr Andreesen. Bob was a 1943 graduate of the Anamosa High School. Bob spent his entire life farming. He will be missed dearly by those closest to him.